Color captivating care for color-addicted hair. Color Extend Magnetics are a line of hair color protection products that capture salon-fresh vibrancy with next generation hair color care technology. Redken’s exclusive IPN and Charge-Attract Complex deliver charged amino-ions that are attracted to the hair fiber to help seal in color. Color Extend Magnetics products make sure hair color is secured with maximum vibrancy and alluring shine. Our sulfate-free hair color protecting shampoo is a lightweight, gentle, conditioning & cleansing shampoo that uses Redken’s IPN technology and amino-ions to leave your color treated hair 3x more fortified. Our hair color protecting conditioner provides targeted repair to not only detangle your hair, but also leave it feeling smoother, softer and more conditioned. 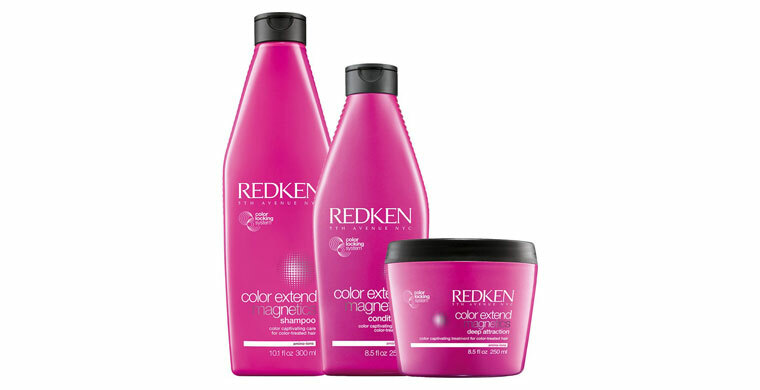 Additionally, color treated hair is 3x more fortified because of Redken’s IPN technology and amino-ions. Our sulfate-free hair mask for color treated hair uses zinc gluconate and IPN technology to extend the life of your hair color and strengthens the hair fiber & strands with intense replenishment to leave your hair feeling softer, smoother and more fortified. 8:30 a.m. – 4 p.m. Please contact your stylist directly for late evening appointment. Here at Level 5 Salon we are trying to do are part with assisting with the environment. As of March 1, 2017 we will begin to recycle 95% of our waste. Submit the form on our Contacts page to receive information about products, services, special offers and promotions, as well as upcoming events at Level 5 Salon. With each client you refer to Level 5 Salon, you will receive the following generous credit towards your next service. Simply download and complete the Customer Referral Card with your referral name, and endorse the introduction portion! The certificate must be presented at the time of the service.